In response to a Very Sensible Request From A Fellow On Twitter, here’s a series of screenshots that shows off the Retina MacBook’s five screen settings. Here’s the default/”Best” setting. It approximates the real estate of a conventional 15″ MacBook Pro. Lovely. 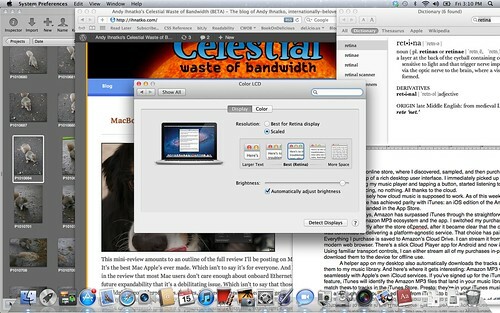 Note the difference between Retina and non-Retina-optimization. 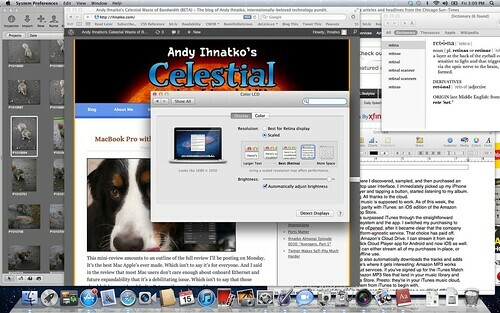 Safari is optimized; the text is crisp and gorgeous. Pages isn’t; if you look carefully, you can see the anti-aliasing of low-res text. 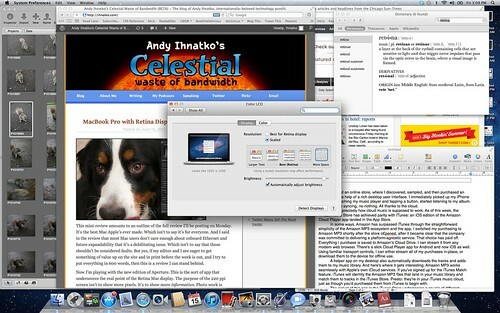 Similarly, compare the Aperture thumbnail window with the doggie in the Safari window. Aperture is optimized; you can see lots of detail in Mr. Squirrel’s fur. The website serves a conventional web-ready image; you can’t see much detail in Doggie’s nose. Onward to the…hey, is Apple saying that all of these other settings are “Worse”? What the hell, man?!? 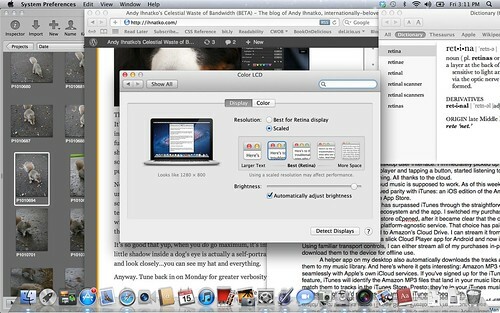 This is the “Larger Text” setting, for folks who have poor vision or are simply nostalgic for 2001-era laptops. It mimics a 1024×640 display. Aha! Note that the OS scales the text to the correct height relative to the size of the screen BUT it’s still rendered at 220 ppi. At least in the optimized apps. The text in Pages still looks a bit trashy. And if you don’t care so much about The Stunning Retina-Quality Graphics and you just want to have the largest desktop you can get, there’s the final “Screenus Maximus” mode: 1920×1200. 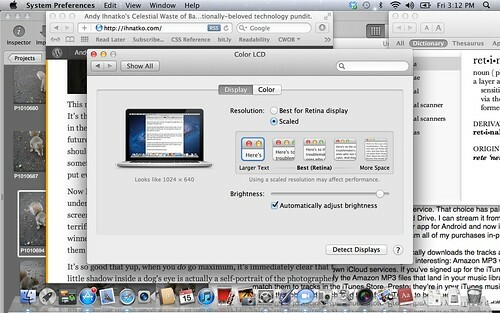 Note that this is still under the Retina MacBook’s maximum true resolution of 2880 by 1800. So optimized apps will always, always, always look better than non-optimized ones. Yes, I see a hand raised at the back? Ah. Well, I don’t actually have a projector here in the office. But I plugged it into the next best thing: a monitor that supports 1920×1080 resolution. I hooked it up via VGA, the way you’ll probably do it in a conference room. As soon as the Retina MacBook senses that it’s been plugged into an external display, it dispenses with the “I know this is a Retina display”-optimized version of the “Displays” system pref box and returns to what you’d see on a conventional Mac. There are two “Figure it out for me” settings: tell the Mac to use the optimal Retina layout (similar to the “Best” size/setting), or do what the screen thinks is best, or do what the Mac thinks is best. Or, you can click the “Scaled” option and force a certain resolution. Before I made a choice, the screen auto-synced to its maximum resolution. No problems. How’s it look? Pretty good. 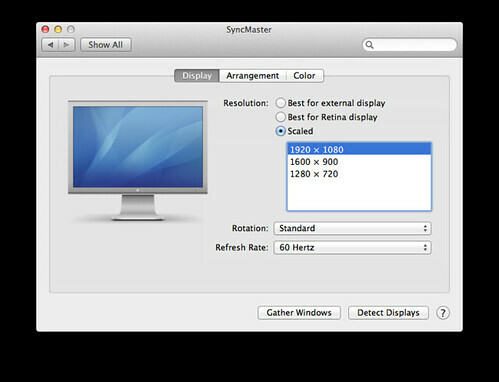 My Samsung monitor has a lower maximum resolution than the Retina MacBook — cripes, don’t they all? — but even in “Best for Retina Display” mode I could easily tell the difference between crisp Safari text and the aliased Pages text. This mini-review on the Sun-Times site amounts to an outline of the full review I’ll be posting on Monday. It’s the best Mac Apple’s ever made. Which isn’t to say it’s for everyone. And I said in the review that most Mac users don’t care enough about onboard Ethernet and future expandability that it’s a debilitating issue. Which isn’t to say that those shouldn’t be considered faults. But yes, if my editor and I are eager to get something of value up on the site and in print before the week is out, and I try to put everything in 600 words, then this is a review I can stand behind. Now I’m playing with the new edition of Aperture. This is the sort of app that underscores the real point of the Retina Mac display. The purpose of the 220 ppi screen isn’t to show more pixels. It’s to show more information. Photo work is terrific. Thumbnails are so dense that you feel like you can truly pick out the winners in a sequence of photos without having to maximize each and every one of them individually. It’s so good that yup, when you do go maximum, it’s immediately clear that the little shadow inside a dog’s eye is actually a self-portrait of the photographer. Click and look closely…you can see my hat and everything. Anyway. Tune back in on Monday for greater verbosity.